The name Runbo doesn't ring any bells, does it? That's because behind it is a Chinese company focused on making phones you can't really classify as high-end. Yet several of its offerings were present at CES and among them were these two quite peculiar Android smartphones. 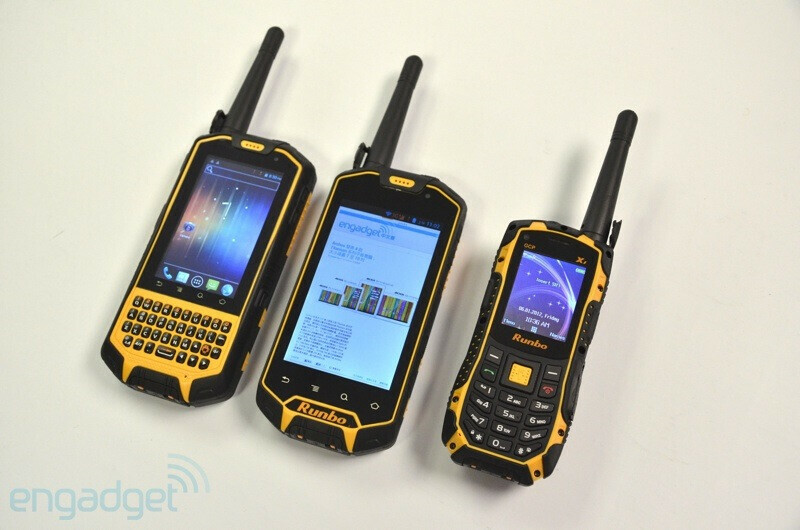 As you can probably tell by the way they look, the Runbo X3 and Runbo X5 smartphones are built tough. Even drops onto concrete probably won't be enough to cause any serious damage. Both handsets are IP67-certified, which means that they should survive after a dunk in water for up to 30 minutes at a depth down to 3 feet. You also get a walkie-talkie that works at a distance of up to 10 kilometers, hence the massive antenna you see in the photo. When it comes to hardware specs, the two smartphones don't have much to shine with, but they aren't too bad either. The Runbo X5 comes with a 4.3-inch WVGA screen and a 1GHz dual-core chip by Mediatek. There's also an 8MP camera on its back, a front-facing camera, and a built-in loudspeaker that should be surprisingly loud. The 4GB of storage can be expanded with the use of a microSD card, while the gigantic 3,800mAh battery will keep you running for quite some time. 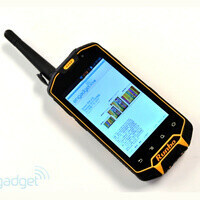 As for the Runbo X3, it is very similar to its sibling from a technical standpoint. The most significant difference between the two is that the screen has been shrunk down to 3.5 inches in order to allow for a portrait QWERTY keyboard to be added. Just like the Runbo X5, the X3 comes with stock Android 4.0.4 ICS. Last but not least, there's the Runbo X1, pictured on the right. You probably won't be too excited about it, however, as it is just a humble feature phone. Still, it also has an IP67 rating for water and dust resistance, and should be able to withstand at least as much beating as its bigger brothers. Runbo is offering the X3 and X5 to U.S. buyers for less than $400 on eBay, which is actually a pretty reasonable price for a tough Android smartphone. Check them out at the link below in case you're interested. No sopport or sevices for this phone…. do not buy this phone….! in June 2013 i buy on amazon a runbo x5 for $ 447.98 dollars to a company called OPRN TECH GROUP. at 3 months the phone makes noise at the speaker and the company OPRN TECH GROUP SEND ME A NEW PHONE. In December the screen stopped responding. the phone is like new, no scratches bumps and turns on and you see the screen but does not respond to touch. I have sent emails to for months, and I have no answer… There is no phone number to call for support en the web page No sopport or sevices for this phone…. do not buy this phone…. !